This is just one way STARR get out into the community and with more than 10,000 people watching what can go wrong. 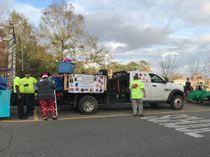 The Civic Women's Club of Picayune Annual Christmas Parade is held the first Monday in December. The theme for the Christmas Parade changes each year and is not known by the entries until just a couple weeks prior. The fun part with STARR is incorporating the Christmas theme with our Water Rescue organization which has been challenging but extremely fun as our ideas are some times out-the-box. In 2015, STARR actually won "Best Over All" with our creative thinking and each year our team brings more decorations as well as ideas to the table. This community event brings the team together with smiles and cheer, allows us to express our mission goals with water safety, and of course throw all sorts of goodies to everyone lining up on the streets. Oh and yes, we pass out our water safety coloring books with colors to all the kids throughout the route making sure every child gets something. Here are just a few pictures of our floats from start to finish over the years. 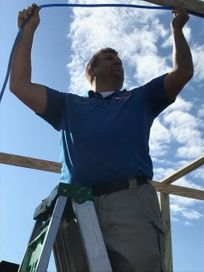 STARR also need to say a special thank you to AJ Guillot and Walkers Motors for providing the one thing every float needs - trailer, truck, and music. The 2016 Civic Women's Club Annual Christmas Parade was to say the least very interesting. After several hurdles, a couple of committee meetings, and a couple of days scratching our heads the float and theme came together. 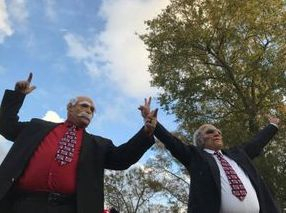 The theme for 2016 was 'Home for the Holidays'.Then severe weather postponed the parade which is held the first Monday in December to the second Monday (the following week). This of course provide some outstanding logistical problems that were solved with the help of our wonderful members. 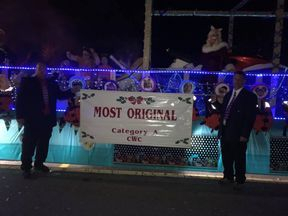 Although this year we did not come home with an award we did come home with some AWESOME compliments from not only the Civic Women's Club but many others who saw our float. STARR created an idea of using the Guardians (Mother Nature, Father Time, Sandman, Tooth Fairy, Easter Bunny, Cupid, and of course Scott Calvin) and members of STARR were bringing them home for the holidays. Our thinking-outside-the box made for an interesting set up that everyone loved. It is always nice to hear people in the crowd saying "Hey there is that float with the Jet Ski again". The weather managed to hold off until after the parade which made for a great night. This parade seemed to have lots of new people and not so many of the older ones. Nevertheless, it was WONDERFUL to be involved with the community and share such a special time. The Civic Women's Club theme was "Two Hundred Years of Christmas", celebrating the 200th anniversary of Mississippi's statehood with an emphasis on depicting some of the things all love about Mississippi, a particular decade, or even a specific historic event in Mississippi's history. Of course, this was a broad topic but our members with some creative thinking came up with a GREAT idea. Jim Henson, the creator of the Muppets and Sesame Street was born in Greeneville, Mississippi so the committee thought what better way to have fund and also depict the just a small part of Mississippi's history. After much thought, a couple of Christmas Committee meetings the idea of a Muppets Christmas with STARR came to pass. 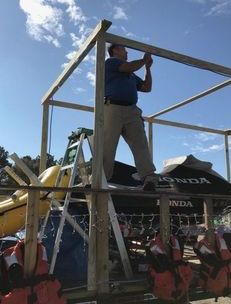 The trailer was brought to the office a few days before Thanksgiving and the next week plus building began. Just like all ideas, some were improved, other modified, and still others taken into a whole different light. 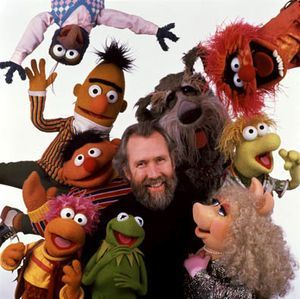 As the days passed, ideas became reality, creativity became characters and members became the Muppets Cast. Donations to the team to give children something more than candy were provided by so many individuals. Pencils, cars, colors, beads, coloring books and much more were gathered. As the day of the parade approached all the fundamentals and foundation of the float were completed. Then just like parades of years past, the team packed up early on parade morning to head out to 'Donut Time' to put the final touches to the float. As those riding the float began to arrive, the music, throws, bubble and smoke machine were secured. Rope lights on the blue background to simulate waves were added snowflakes and tensile just before heading to the parade route and...... judging time. The parade was full and there were lots of floats but STARR and its members once again, giving their best and 100% effort pulled out the win - "MOST ORIGINAL FLOAT". This could not have been done without the team effort of everyone and like always TEAM STARR works together to set the bar. There was Kermit, Ms. Piggy, Statlor and Waldorf, Fossy Bear, Animal, Cookie Monster, Bert and Ernie, Elmo, and of course Oscar the Grouch with Guest Stars Christine and AJ. As STARR rolled out slowing making its way through the crowd the sounds of "there is that float with the jet ski again" rings out making it all worth wild; letting the community know we appreciate them. However, this year was slightly different than most. This year our music was "Muppets Christmas", was DJ'd by 'Life of the Party' who donated their time and equipment, and conducted by Statlor. What was really special about Statlor conducting his crew while singing Christmas songs is how the entire crowd started singing the songs which made for a truly wonderful Christmas parade. As in years past the Civic Women's Club created a great theme this year: "The Twelve Days of Christmas". Of course, the meaning of the Twelve Days of Christmas is simple. Christmas Day is the first of the Twelve Days of Christmas. The period is viewed by Christians as the amount of time it took the three magi, or wise men, to travel to Bethlehem for the Epiphany, the revelation of Jesus Christ as the savior and the son of God. 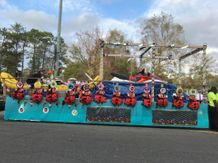 Just like years past, our members put their heads together and through some creative thinking once again comes up with a design that can transform a flat bed trailer into an award winning float. Although it seemed that STARR may not have a trailer to build a float, suddenly a miracle appeared and we had a trailer for a float. So in STARR tradition, using our rescue ski and rapid deployment craft as back-drops, we began putting the design together. In between the rain storms and various other delays, the trailer was soon turned into a great float to be displayed in the Christmas Parade. Donations from so many people to the team allowed STARR to give all the children a little something more than candy. These items included pencils, colors, coloring books, toys, stuffed animals, beads and yes some candy as the Christmas Parade can't go without some candy. As Parade Monday quickly approached all the fundamentals of the basic design was completed. Like Christmas Parades in the past, the team packed up the night before for an early start on parade day. Unfortunately, we were unable to use the "Donut Time" parking lot. 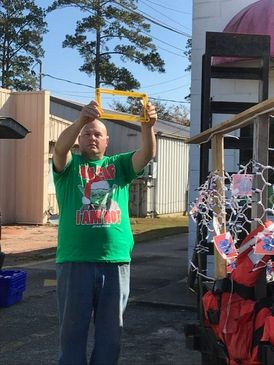 But thanks to our Marketing Director Christine, after a few calls, STARR had a spot in the "Old Sears" building parking lot to put the finishing touches on the float. Ironically, there were still some hurdles that had to be overcome but in true fashion we surpassed them with flying colors. The music, throws, bubble and smoke machines were in place. Rope lights and skirting attached some "Peanuts Christmas" items, tensile, and few snow flakes as the alarm rings out it is that time.... Judging will start soon. Quickly, we put up all the tools, fold up the tables, close the doors and make our way to Goodyear Blvd to get into our position on the parade route and await judging. 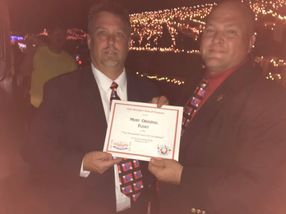 The parade was full and there were lots of floats but STARR and its members gave 100% and for the 3rd time in 4 years received an award - "MOST INSPIRING FLOAT". None of this could have been possible without the efforts of our team members, our supporters, and the many others to make TEAM STARR on of the best.